Cycling in Brussels for me is ... being free to discover and experience the city. The spot in Brussels I love to be discovered… the house boats in Anderlecht. Wind in the high trees, a few boats in the water and so close to the city center! What we definitely will speak about during our tour… everything that's green and more! Cycling in Brussels for me is… obvious. The spot in Brussels I love to be discovered… is heaven-sent. What we definitely will speak about during our tour… are kings and monsters. Cycling in Brussels for me is... rolling freedom! The spot in Brussels I love to be discovered by others... the view the Brussel’s skyline by day from a bridge in Molenbeek. The maze of the botanic park as well as the hidden park next to the finance tower that gives you an insight on the planned future of Brussels at the end of '50, the statue full of pigeons on place de la Liberté, the peace in the quartier du béguinage. What we definitely will speak about during our tour…. the history of Brussels through stories. The spot in Brussels I love to be discovered by others... the European district: more exciting than you think! Cycling in Brussels for me is... going where and whenever I want to go! With respect for city and its inhabitants. The spot in Brussels I love to be discovered by others... the hellhole of Europe, the heart of fundamentalism, the town that needs to be cleaned up…: Molenbeek. That’s a joke of course! But I’d love to introduce you to this wonderful and surprising part of Brussels as well as the canal area and its citizens. What we definitely will speak about during our tour…. the quality of life and living together in this super diverse city. Oh yes, and biking in Brussel of course! Cycling in Brussels for me is... natural and obvious. The spot in Brussels I love to be discovered by others... not yet discovered. What we definitely will speak about during our tour…. are the sounds and images this city has to offer. Cycling in Brussels for me is... seeing, smelling, hearing and feeling the city of Brussels. The spot in Brussels I love to be discovered by others... Some hidden places to see and feel the contrasts of the city. Every trip through Brussels brings its own surprises. What we definitely will speak about during our tour…. The contrasts, the complexity and the diversity of the city. And how and why would anyone live in this city? Cycling in Brussels for me is... non-stop rediscovering the city. Brussels is a permanently living and changing city, that’s what makes Brussels nice and lovely. The spot in Brussels I love to be discovered by others... are those places you wouldn’t discover on your own. 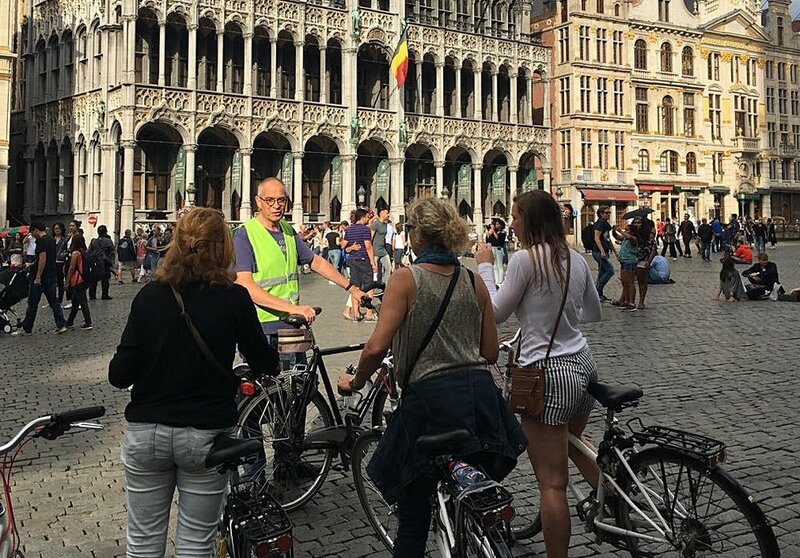 By discovering Brussels by bike, you experience more than just the city centre or those places where public transport takes you. What we definitely will speak about during our tour…. green in the city, water, beauty and fun in Brussels ! Cycling in Brussels for me is... feeling free and enjoyment! The spot in Brussels I love to be discovered by others... small quiet hidden parks and vibrant areas. What we definitely will speak about during our tour… the Senne (river) and Zinnekes (Brusseleirs). Cycling in Brussel for me is...being a tourist on a daily basis in my own city: continuing to explore and experience the city with all my senses. The spot in Brussels I love to be discovered by others... my yoga spot in Duden Park (Forest) with a splendid view over Brussels with the Parc the Forest, the Justice Palace and the towers of the North quarter on one line.